Learn to Make Traditional Rajasthani Sev Tamatar Ki Sabzi Recipe with the step-by-step video tutorial. 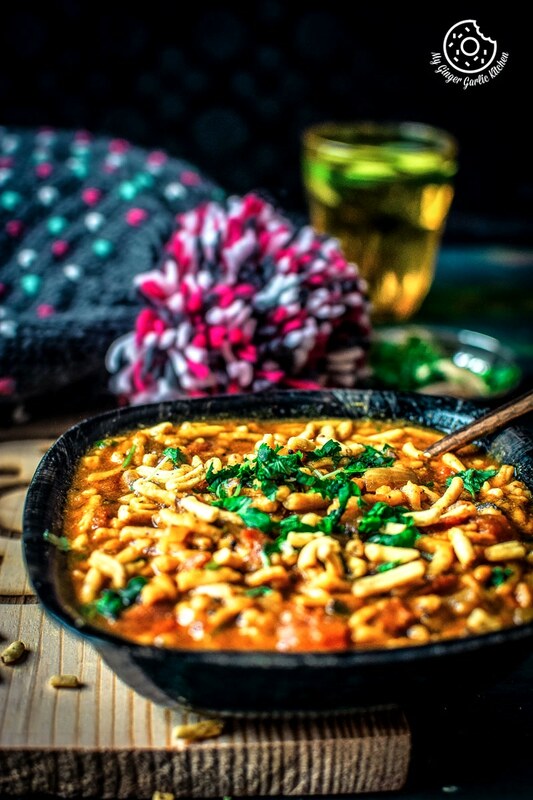 Making this fabulously scrumptious ‘Rajasthani Sev Tamatar Ki Sabzi’ is super easy and very quick. Only the basic kitchen ingredients are required for cooking this spicy fleshy sabzi. The base for this sabzi is made using pulpy tomatoes, and spicy onion masala. This expeditious sabzi is an impeccable solution for the days when you don’t have any vegetables in the fridge. If you love spicy Indian curries, then I can tell that you are definitely going to devour this spicy curry, which is so full of chunky tomatoes and onion masala. A topping of spicy sev on top, right before serving is all you need to make it irresistible. 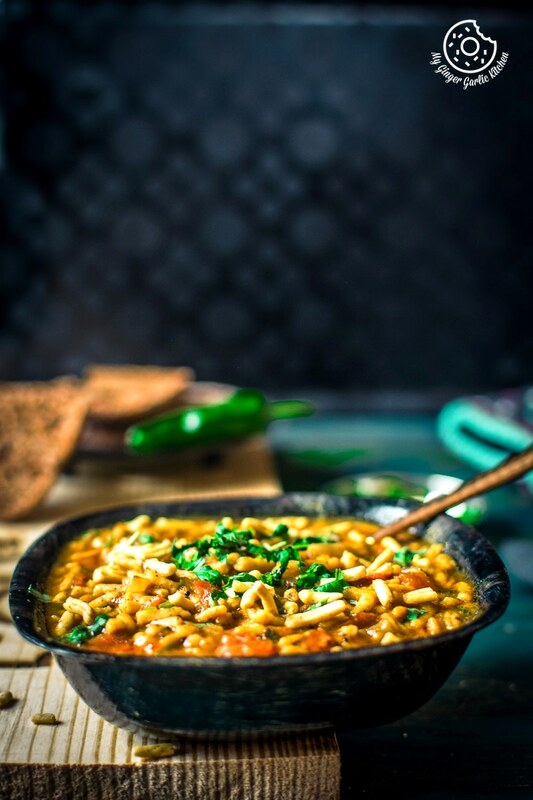 Rajasthani Sev Tamatar Ki Sabzi is one of the most popular spicy, quick and easy curry recipes from Rajasthani cuisine. 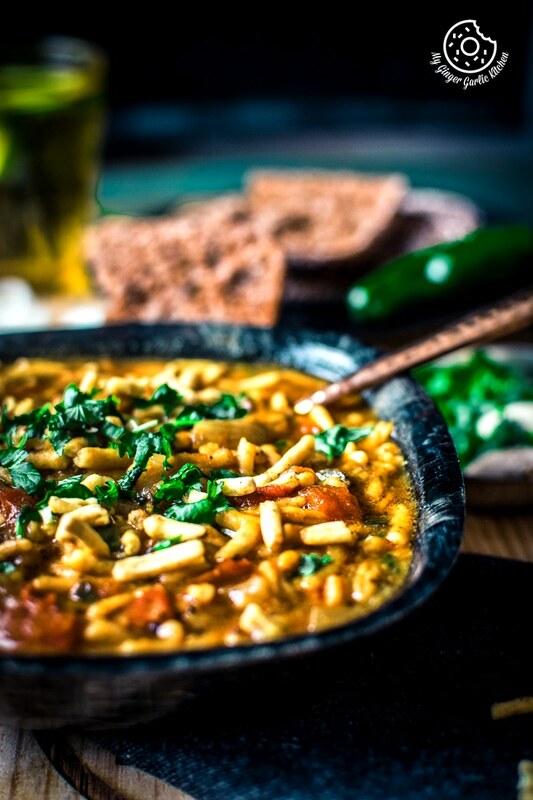 This vegetarian, gluten-free, dairy-free curry can be ready in under 15-20 minutes. 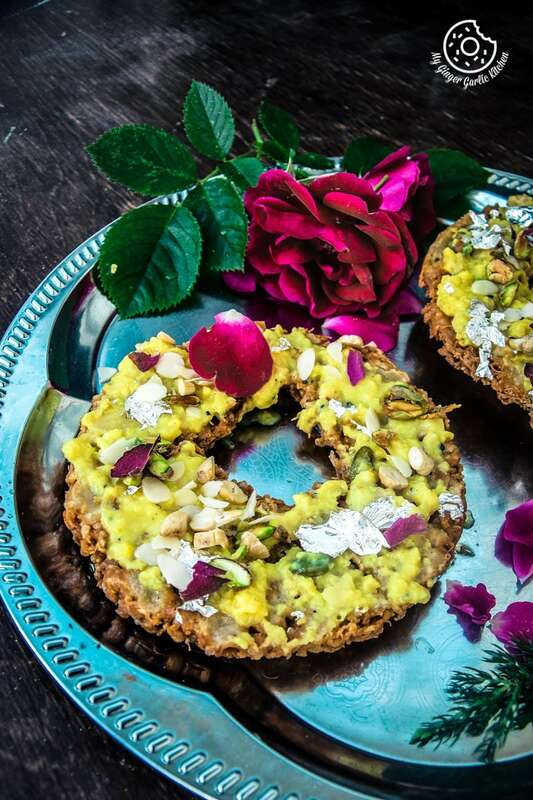 You all know that I have a soft corner for all the Rajasthani recipes because my hometown is ‘Jaipur’ — The capital city of the Indian state of Rajasthan. Historically, Rajasthan has been the land of Kings and queens. Rajasthan is the land of Rajputana. And the literal translation of Rajputana is Royals. Thus, Rajasthan is well known for its royal culture and traditions. When we talk about authentic Rajasthani food, then the first thing which comes to everybody’s mind is doubtlessly ‘Dal Baati Churma’. Isn’t it? During the royal times many years ago, at the times of war when the soldiers faced a lot of antagonistic situations, there was a serious demand for a long-lasting food. Thus, the warlike the lifestyle in Rajasthan gave birth to the dishes which can last for a long time and can be eaten without heating. Rajasthani cuisine has a wide range of vegetarian and meat dishes. 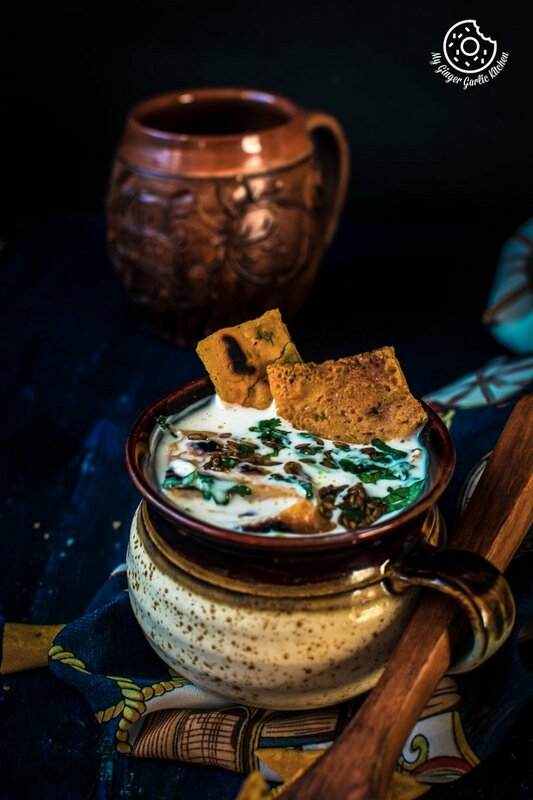 But if you are a vegetarian, then you’ll definitely find a great range of vegetarian dishes in Rajasthani Cuisine, because Rajasthan is one of the most vegetarian states in India. Records show that 70% of the people in Rajasthan are vegetarians. 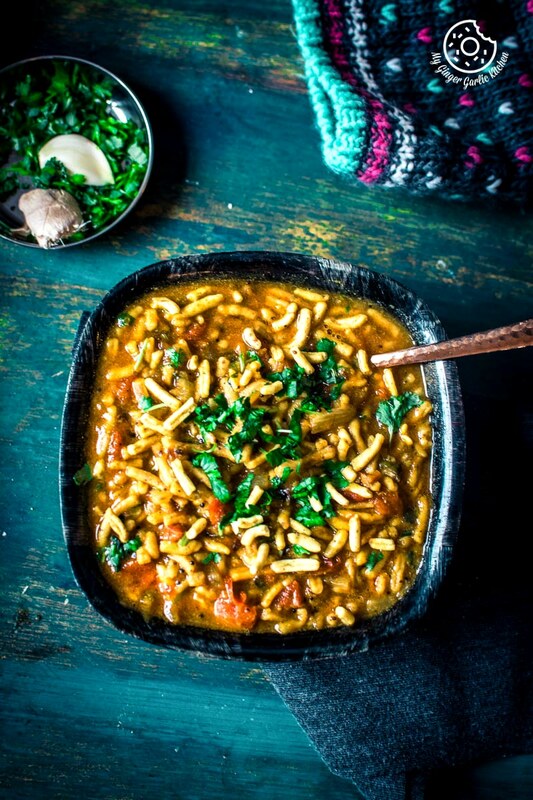 Today I am sharing Rajasthani version of Sev Tamatar Ki Sabzi. But Sev Tamatar ki sabzi is also famous in the neighboring Indian states of Gujarat and Madhya Pradesh. 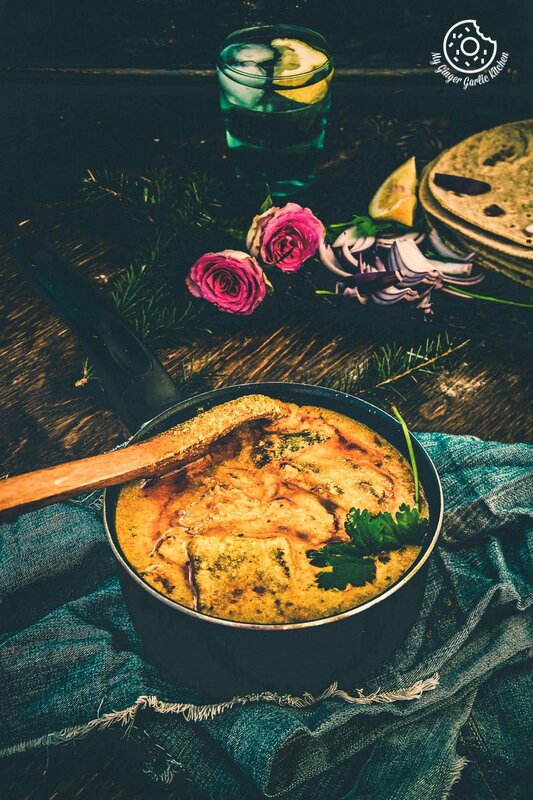 In Gujarati cuisine, this sabji is known as ‘Sev Tamate nu Shaak’. The main difference between Rajasthani and Gujarati sabzi is the heat level. Rajasthani Sev Tamatar sabzi is a bit hotter than Gujarati version of sev tamatar sabzi. You can serve this spicy, tangy and luscious sabzi with Khoba Roti, Phulka, or even with parathas. Sev is spicy and crunchy gram flour noodles. 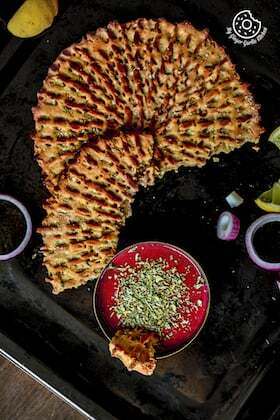 This is a flavorful, spicy, crunchy, crispy and deep-fried snack made using besan and spices. Sev Tamatar Ki Sabzi is also one of the very popular Rajasthani curries served on the roadside eateries aka Dhabas. At dhabas, they usually serve this sabzi along with some plain roti or tandoori roti. The version I am sharing today is the onion garlic version, but if you don’t like onion-garlic then you can simply skip the onion-garlic and follow the same steps. I have been very fond of ratlami sev / namkeen aka crunchy and spicy noodles made from chickpea flour/gram flour (Besan). So I normally use ratlami Sev for making this sabzi. But you can use any other moti namkeen or bhujia for making this sabzi. 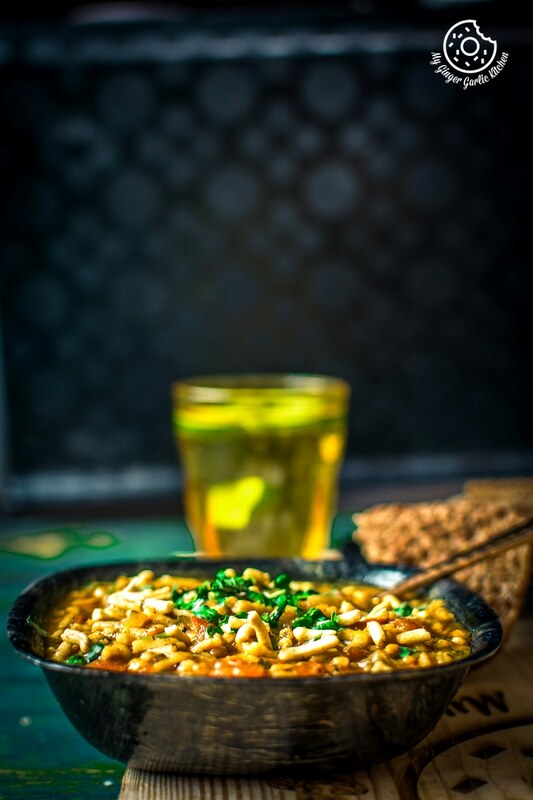 Making this fabulously scrumptious ‘Rajasthani Sev Tamatar Ki Sabzi’ is super easy and very quick. Only the basic kitchen ingredients are required for cooking this spicy fleshy sabzi. The base for this sabzi is made using pulpy tomatoes, and spicy onion masala. This expeditious sabzi is an impeccable solution for the days when you don’t have any vegetables in the fridge. 1. Heat 3 Tbsp oil in a wok/kadhai on medium heat. 2. When the oil is hot, add mustard seeds, cumin seeds and let them crackle. 3. Once they crackle, add the finely chopped garlic, green chilies and sauté them till the garlic turn golden in color. 4. Add the chopped onions and sauté for 3-4 minutes or until they are translucent. 5. Add the chopped tomatoes and mix well. 6. Let them cook till they turn mushy. 7. Now add the turmeric powder, red chili powder, coriander powder, and salt. 8. Mix well and cook for 3-4 minutes. 9. After 3-4 minutes, add 2.5 cups of water. Mix well and let it boil for 5 minutes. 10. Turn the heat to low and add 1 cup sev. 11. Mix gently and let it boil for a minute. (You can turn off the heat at this point). 12. Add garam masala powder, coriander leaves and mix lightly. 13. 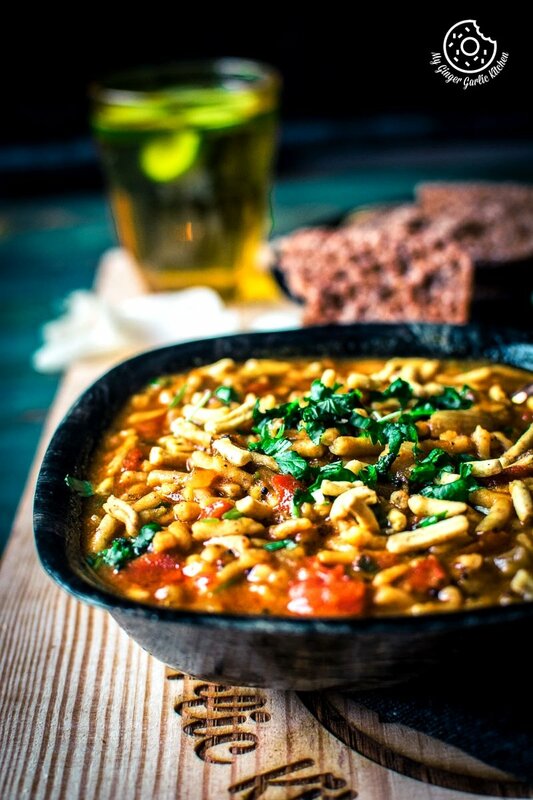 Top with 2 Tbsp Sev and Garnish it with chopped coriander. 14. 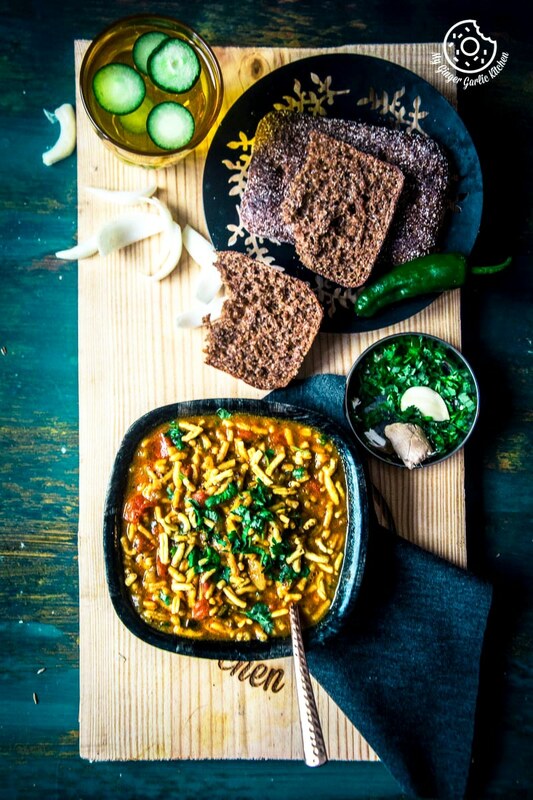 Serve hot Rajasthani Sev Tamatar Ki Sabzi with roti or paratha. 1. The version I am sharing today is the onion garlic version, but if you don’t like onion-garlic then you can simply skip the onion-garlic and follow the same steps. 2. I have been very fond of ratlami sev / namkeen aka crunchy and spicy noodles made from chickpea flour/gram flour (Besan). So I normally use ratlami Sev for making this sabzi. But you can use any other moti namkeen or bhujia for making this sabzi.